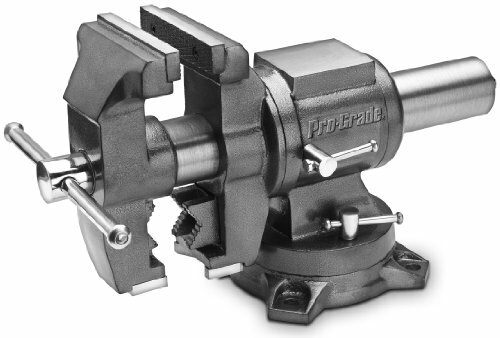 Pro-Grade products are designed and built with one goal in mind- to equip you with the best value available in Professional Quality Hand tools. To ensure long-lasting durability and performance, we start by using only premium quality raw materials like Chrome Vanadium Alloy, chrome Nickel and High Carbon Tool Steel. Precise manufacturing techniques and strict quality control are then added so that every product will meet or exceed A.N.S.I. In fact we're so sure of our product's quality; every item is backed up by an Unconditional Replacement Warranty for the life of the tool. With that in mind you will find this Workshop vise with 270 degrees locking swivel base and replaceable jaws a must for any shop or job site. If you have any questions about this product by Pro-Grade, contact us by completing and submitting the form below. If you are looking for a specif part number, please include it with your message.